To say that Philippine President Rodrigo Duterte’s chairman’s statement issued on April 29 following the 30th ASEAN Summit in Manila was a little soft on China “would be an understatement,” a Philippine diplomat told me hours after its release. One would be hard-pressed to disagree. Virtually all language that could be deemed critical of Beijing’s South China Sea assertiveness was removed – leaving out the same words that Philippine diplomats once fought for and remaining silent on the same actions that continue to undermine Manila’s own interests. And as if to add insult to injury, he repeated his refrain that pressuring China on the South China Sea issue would be unproductive and visited Chinese warships docked in his hometown after the statement was issued. With this episode, Duterte has unquestionably dealt ASEAN a major blow on the South China Sea, even though that was both far from surprising as well as much less dramatic than the headlines might suggest. Actions like these have serious implications, not just for the Philippines, but for the region and even outside actors like the United States. That said, though the incident does deserve attention, it should not obscure the more enduring challenges on the South China Sea that existed before Duterte came to power and will likely continue to bedevil actors for years to come. Duterte has unquestionably dealt ASEAN a major blow on the South China Sea, albeit in a less surprising and dramatic manner than some have suggested. From the time he took office, Duterte has consistently said that he does not see emphasizing the South China Sea issue in general and the verdict by the Permanent Court of Arbitration (PCA) on Manila’s case against Beijing in particular as being practical since the Philippines’ options are limited and it might undermine his ongoing rapprochement with China, even though the former reason is often seen by his critics as little more than an excuse for the latter (See: “China and the Philippines Under Duterte: Look Beyond a Voyage”). Given this, the question that most seasoned observers had going into the ASEAN Summit in Manila was not whether we would see a strong chairman’s statement, but how weak it would be. That does not excuse the statement itself. Though language on the rule of law and principles such as the freedom of navigation and overflight was preserved and a veiled reference to the PCA verdict was kept – a point often missed amid claims of total Philippine capitulation – the statement omitted any mention of negative Chinese behavior in the area, including militarization, escalation, and land reclamation, all of which were detrimental to Philippine interests. The failure to mention Beijing’s transgressions – beyond the generic statement expressing concern among some leaders about developments in the South China Sea – is nothing short of embarrassing considering that this was a standard that even Laos, a laggard on the issue, cleared when it chaired ASEAN last year (See: “Assessing ASEAN’s South China Sea Position in its Post-Ruling Statement”). In doing so, Duterte has sent a dangerous message to China that it does not have to pay that heavy a price for too long for its assertive actions in the South China Sea. If even the Philippines, which had for years been most forward-leaning state resisting China’s South China Sea assertiveness, can ultimately bend to China’s will, what incentive does Beijing have to change its behavior? 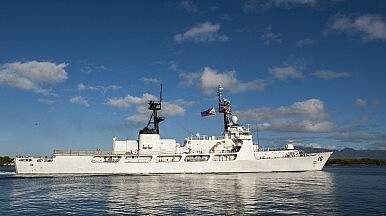 Instead, it is far more likely that this emboldens hawkish voices in Beijing that while Chinese assertiveness may lead it to incur some costs in the short term, it can simply absorb these costs for a while and then look to recover its losses by charming those it previously coerced (See: “The Real Danger of Duterte’s South China Sea Approach”). The implications extend far beyond just China and its relationship with the Philippines and Southeast Asian states more generally. Regionally, it temporarily slows whatever little diplomatic momentum was building within ASEAN on the South China Sea issue (some of which was the result of hard work put in by Philippine diplomats). A weakening of the position of the most forward-leaning claimant state also makes it more likely that other Southeast Asian states will also adopt a softer line, especially laggards like Cambodia, which as it is has needed little excuse to do so (See: “Does ASEAN Have a South China Sea Position?”). It also makes it more difficult for outside actors like the United States to play a more active role in the South China Sea disputes if they are hesitant to get ahead of the claimants themselves. Though a stronger role by extraregional states comes with its own complications, the reality is they are ultimately required to both mitigate the vast asymmetry in military capabilities between ASEAN claimant states and China as well as to enforce international principles. But while it is important not to understate the significance of this development, it is equally important not to overstate it. Simply placing the blame on Duterte’s blow obscures the more enduring challenges on the South China Sea question that the Philippines, ASEAN, and outside actors like the United States had all been grappling with before Duterte came to power and will likely continue to bedevil them for years to come. For the Philippines, while the chairman’s statement does suggest that concern is warranted regarding Duterte’s China approach, it is still early days. Duterte is just the latest Philippine president to contend with Manila’s dilemma – one faced by all Southeast Asian states to varying degrees – of how to pursue good ties with China despite concerns about its rise. As he does so, he is not immune to the domestic constraints that affect how Philippine presidents have balanced the country’s international alignments, including public opinion that is still quite skeptical of China and a defense establishment that has a long history of working with established security partners like Washington and Tokyo instead of new ones like Beijing and Moscow (See: “The Limits of Duterte’s China-US Rebalance”). Indeed, we have already seen instances where military officials have spoken out much more fervently against China’s South China Sea behavior while emphasizing the importance of maintaining a strong defense relationship with the United States. The two presidents that preceded Duterte, Gloria Macapagal Arroyo and Benigno Aquino III, learned the limits of engaging Beijing the hard way: Arroyo when she was accused of selling out Philippine interests to China, and Aquino as China began dialing up the temperature on the South China Sea even early on in his term. If he does not tread carefully, Duterte could well suffer the same fate, and his olive branch to Beijing could very quickly turn south. Additionally, given that we are still not even through the first year of Duterte’s single six-year term, with the trajectory of the U.S.-Philippine alliance and broader Philippine foreign policy still left uncertain, it would be premature to conclude that his initial views will end up being his eventual legacy (See: “Recalibrating US-Philippine Alliance Under Duterte”). As for ASEAN, though the issuance of the chairman’s statement was yet another sign that institutional constraints and recent pressures are hampering its ability to deal with the South China Sea issue, one ought not to exaggerate either its role or the impact on it due to a single round of summitry (See: “ASEAN Must Heed Early South China Sea Warning”). ASEAN is only one of several avenues through which Southeast Asian states pursue their interests, and even then, its role is quite circumscribed and largely confined to simply diplomatically managing the South China Sea question. In truth, even that has long proved challenging since it operates by consensus, with just four of ten ASEAN members involved in the disputes and others displaying varying degrees of interest in it. Indeed, the Philippines’ filing of its South China Sea case internationally further exposed the regional divisions within the grouping, with some refusing to back Manila’s bid and others even blaming it for forcing them to choose sides and souring the subregion’s ties with Beijing. At the same time, despite skeptics either sounding the death knell of ASEAN or calling for panaceas of various kinds after organizational breakdowns or foul-ups – from Phnom Penh in 2012 to Yuxi in 2016 – ASEAN has continued to hobble along. Precisely because these incidents have occurred, Southeast Asian states are more aware than ever of both the challenges facing ASEAN on the South China Sea question, and as they have done in the past, they are finding ways to adapt and manage them (See: “What Really Happened at the ASEAN-China Special Kunming Meeting”). Furthermore, for all ASEAN’s limitations, factors such as the rotation of chairmanships and country coordinators, changing national leaderships, and evolving regional and international dynamics all tend to create more of an ebb and flow with respect to its South China Sea response rather than the picture of perpetual paralysis or linear deterioration that some continue to paint. As the chairmanship passes on from the Philippines in 2017 to Singapore in 2018, and then from Thailand to Vietnam in 2019 and 2020, that general rhythm will likely continue. With respect to so-called outside actors, while this incident has certainly created additional complications for them, it should also be viewed as an opportunity by these states to reassess how best to play their respective roles on the South China Sea issue. As I wrote after the PCA verdict, the challenge before the informal diplomatic coalition of sorts formed in defense of the rules-based international order – including the United States, Japan, and Australia – was how to enforce the verdict amid defiance by China and wavering by ASEAN claimants including the Philippines (See: “US South China Sea Policy After the Ruling: Opportunities and Challenges”). That challenge remains today, and tough questions need to be answered. For instance, though not getting ahead of claimant states may be prudent when they are themselves doing their part to preserve regional unity and global solidarity, does it also make sense when we see backsliding from those states like the Philippines, and, if not, what alternatives should be pursued? Are some members of this so-called coalition willing to impose costs on China for its South China Sea behavior if necessary through diplomatic, military, and economic measures, thereby risking a deterioration of their own ties with Beijing and foregoing the very same opportunities that other states are benefiting from? At the center of all this is the role of the United States, which still remains unclear as President Donald Trump’s Asia policy continues to shape up. As I have noted before, the wild swings we have seen so far by the U.S. administration on a number of issues has led even respected Asian observers to entertain extreme scenarios such as Trump making a deal with Beijing on North Korea at the expense of other issues like the South China Sea (See: “Trump’s Real ASEAN Test”). Though these fears may be misplaced, it would not be the first time that perceptions create their own reality in Southeast Asia, which in turn drive action or inaction. For all the focus on Duterte, he is far from the only source of uncertainty on the South China Sea question, or even its most serious challenge.